A Mars colonist accepts a deal with a mining company to start a new life on humanity’s off-world frontier. But idealism turns to unease when reality becomes darker than the fine print foretold. With his farm under bio-genetic attack and the most powerful player on the planet as an enemy, Mahela has no choice but to run… and expose economic slavery on an interplanetary scale. Kindle Users: I no longer distribute on Amazon. However, you can still read my books! Buy from Smashwords, and you will be able to download the book in .mobi format. You will need to move the .mobi file to your Kindle (via USB), or you can read it via the Kindle Reader mobile or desktop apps. “A fun, thought-provoking, quick, action-packed read. The writer has clearly thought about a billion aspects of colonizing Mars that never would have even crossed my mind. And he raises some really important questions. I finished the book weeks ago and I’m still thinking about it!” – Karen B, Amazon Reader. “[…] a surprising depth and complexity emerges from Red Soil’s inhabitants. The tight focus on a few characters helps keep the action moving and free of annoying digressions. The theme of engineered existence extends through the book, the possibilities and perils of human beings’ control of nature revealed in ways both grand and subtle. […] The world that Ratnayake summons into being is one still sadly underrepresented in genre fiction; a future that is proudly, irreducibly multi-cultural and multi-polar.” – Morgan Crooks, Ancient Logic. “What was great about this book was the realistic approach to Sci-Fi. […] The analysis of human nature is very much on point. […] the storyline gripped my attention and wouldn’t let me go until the very end – I read the book in two days.” – Amazon Customer. 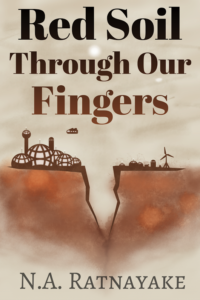 "...a fascinating combination of socio-political issues and the future of engineering and space travel." -- Juliana Ulrich, GoodReads review. SciFi Policy has posted an in-depth interview with N.A. Ratnayake about the social, political, economic, and technical issues in Red Soil Through Our Fingers. For more information, read the many blog posts tagged Red Soil, which include excerpts from the novel and an inside look at some of the world-building. This entry was posted in by Nalin. Bookmark the permalink.